One of the features of our club meetings is are our guest speakers. In January this year, the club heard from Afghani refugee, Hangama Obaidullah, who came to Australia as a refugee in August 2003. She spoke no English, but applied herself to English language and graduated with her Higher School Certificate in Sydney in 2009. Hangama moved to Canberra in 2010 where she practices her art and is currently studying for a Bachelor of Writing at University of Canberra. 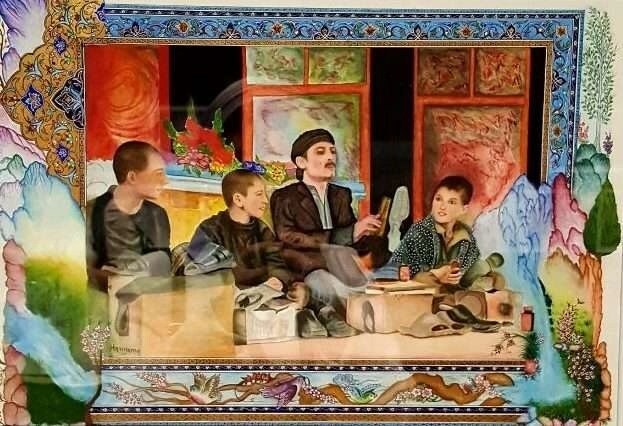 Her goal is to assist other Afghani women and children through her visual arts practice and her writing, drawing on her Afghani heritage and philosophy of ‘beauty, grace and community service’. Rotary Club of Hall decided to support the opening of Hangama’s art exhibition at the Tuggeranong art Gallery which was opened by the Counsellor from the Embassy of the Islamic Republic of Afghanistan, Mr Ateeq Zaki, who made a wonderful speech about the importance of this exhibition as a showcase for a positive view of a Islam and Afghanistan. Pictured above L to R: Ateeq Zaki Minister Counsellor from the Embassy of the Islamic Republic of Afghanistan, Barbie Robinson Hangama and Barbara Baikie.